De­pend­able form-ties and safe sus­pen­sion points are cru­cial for ef­fi­cient and safe us­age of any formwork. For both wall formwork, sin­gle-sid­ed formwork and climbing formwork, a com­plete range of field-proven form-tie so­lu­tions and sus­pen­sion points is avai­l­able. When forming walls, anchoring makes up a large portion of the labour costs. This is where Doka tie rod systems pay for themselves. They have a long lifespan, are easily assembled and resistant to soiling. As a result, you work faster and safer and save money in the process. 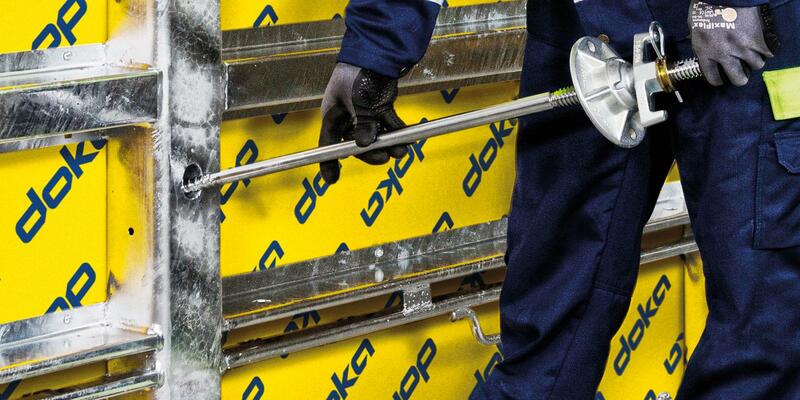 With Doka's super plate you can fix and release any anchor point very quickly using the only tool needed, a hammer. Doka tie rods are made of a special steel alloy and therefore have high tensile strength. A self-cleaning thread ensures rapid fastening, regardless of site conditions. With single-sided formwork, high concrete pressures must be transferred into the concrete base slab reliably. Doka supporting construction frames combined with Doka stop anchors and Doka pigtail anchors safely absorb these forces. Depending on load, the Stop anchor 15.0 or Stop anchor 20.0 can be used for anchoring. Depending on load, the She-bolt 15.0 is used in combination with Pigtail anchor 15.0 or She-bolt 20.0 with Pigtail anchor 20.0. Form-tie points are only watertight if there is good bonding between the concrete and the jacket tubes or anchoring components left in the concrete. Doka supplies anchoring components that create an outstanding bond with the concrete. The Universal climbing cone is suitable for all Doka climbing and dam formwork. Together with the stop anchor and the Cone screw B7cm designed for high tensile forces, it creates a solid connection between the previously poured casting section and the formwork. Doka offers reliable system solutions for working safely on tall structures. In all systems, the sturdily dimensioned universal climbing cones ensure the solid connection between structure and formwork. Various economical suspension variants are available for attaching Doka folding platforms and Doka bracket platforms. You benefit: work progresses rapidly and you can be confident in terms of safety.